For me bread making has always been more of a process than an actual recipe. There is no bread that is not edible, in my opinion. True there is bread that is better than some, but bread is always usable. It might be french toast, or stuffing or even simple bread crumbs, but bread can always be used in full. Couple that with my frugal nature and bread is always used up in this household. Ezekiel Bread made with whole grains. Because of my opinions about bread (And they are just that; opinions. not facts or rules.) I am fearless or some might say foolish in the kitchen when making bread. It doesn't have to be perfect to eat or even share in a post for those that come to visit. Actually my entire content is about improvements for family and home, written like a conversation had during a visit and less like an actual article. Bread can also be broken down into steps, which works well for those that work at home on a tight schedule or those that work out of the home. I fall into the group that works away from home, but I still want to bake our bread and cook from scratch. For our family a healthy loaf of bread means that a good meal is never far away even if it is only to scramble some eggs or heat up homemade soup or stew stored in the freezer. When I first purchased my new mixer, I had to rethink kneading bread (especially since bread was the reason for the purchase). My Kitchen Aid would not handle a standard loaf without over heating and shutting down. The first batch was delicious, but lacking in proper texture, due to a lack of sufficient kneading. This newer version is delicious but also has a very nice texture,yet like all yeast breads improve as the maker perfects their technique. I did make one change, I eliminated the rice for this version. Combine water, vinegar and enough whole wheat flour to make a stiff dough. Stir in raisins. Cover and set aside. 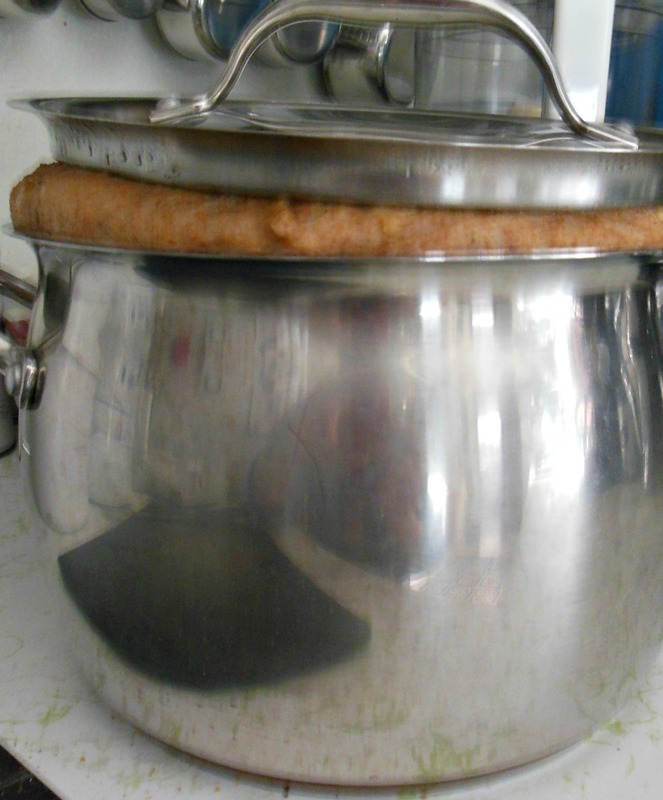 In large bowl or bowl of stand mixer; combine warm water, yeast and sugar. Let proof. Drain cracked wheat and steel cut oats, add to mixer bowl, add soaked wheat and raisin mixture. Milled lentils, whole wheat pastry flour, gluten flour. Coconut oil, honey eggs, salt. Walnuts, sea salt and start with 1 c all purpose flour for kneading. Knead mixture until dough is formed and the sides of the bowl are clean, using only the smallest amount of additional all purpose flour needed. Let rise, covered until doubled. Divide the dough to form loaves. Punch down, divide into 4 equal parts. Ezekial Bread, beginning of second rise. Place into prepared pans for second rise, I like to use the dough proofing setting, but any warm environment will work just fine. Ready to bag and freeze. 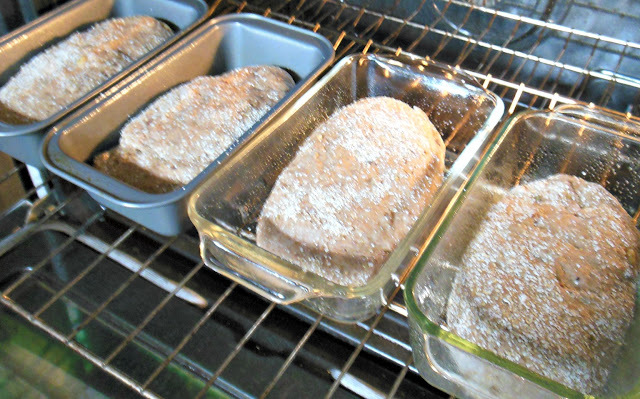 Bake in preheated 350 degree oven 35-45 minutes or until done in your oven. 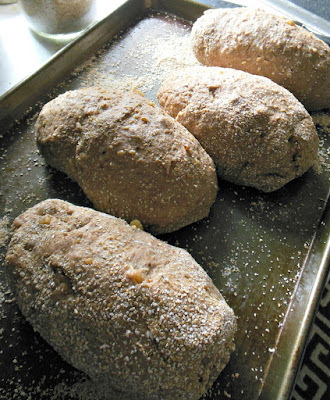 The loaves will have shrunk away from the sides of the pan and turn out perfectly. There is no escaping the clean up! When bread is completely cooled, wrap and freeze until needed. Good timing on this. I've just gotten back into my winter bread baking. (No air-condition means I don't bake in the summer). Too bad your Kitchen Aid didn't work for you. Mine seems to knead just fine. I've never made bread and am envious of those who do. I bet it makes the house smell wonderful. I have never had Ezekiel Bread, but it looks amazing, Melynda! I really enjoyed reading your post as well. Thank you for all the hints and tips - I've pinned this one to try as soon as I can. Thank you for being a part of the Hearth and Soul Hop!